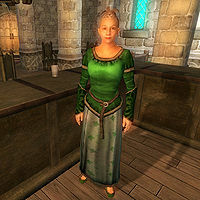 Erina Jeranus is an Imperial publican who is the innkeeper at The West Weald Inn in Skingrad. Every day between 1am and 6am she sleeps in the bed to the left of her counter, and at all other times stands behind the counter selling food and renting beds. As it befits an innkeeper of such a prosperous inn, she wears upper-class attire consisting of a green brocade doublet, green silk garment, and a pair of green velvet shoes. She also carries the key to her inn and some gold. Like an innkeeper ought to do, she greets you warmly: "Welcome to the West Weald Inn. I'm Erina Jeranus, the proprietor. If you'd like food or a bed, speak to me." She's quite knowledgeable about the history of Colovia and knows the differences between Colovia then and Colovia now: "Count Skingrad has ruled here all my life. The county is quiet and prosperous. In the old days, the Colovian Estates were always in the thick of some war or rebellion. But that's ancient history." The strange behavior of Glarthir lately has caught her eye, and she will comment on him should you ask her about Glarthir: "How to say this nicely? He's sort of the town eccentric. Lived here for years, we've gotten used to his ways. Although ... lately he's been weirder than usual. Always looking over his shoulder, writing in his little notebook. I wonder what he's up to now." People will comment on her inn with conversations like "The West Weald is a good place. Erina Jeranus isn't the friendliest person in the world, but not a bad sort when you get to know her. ", "Erina Jeranus isn't the most social inkeeper [sic] in the world, but she runs a good, clean house. ", "Yes, the West Weald is a good place. Just stay away from Erina when she is in a bad mood." and "I like the West Weald itself, but I'd rather avoid its proprietor." These comments also show that Erina can be quite an unpleasant woman at times. So much so, that when the vampire hunters are in town during the Information at a Price quest, she will express her distaste for them as well as giving information about where they might reside: "No one like that staying here, I can assure you. I don't want that kind of clientele. Of course, I wouldn't put it past the Orcs over at the Two Sisters Lodge to rent them a room." Jeranus is odd in the way that she is permanently essential, even though she has no quest ties and is pretty much a background character. The most probable reason for this is that she's related to the unfinished "Imperial Couriers" quest; at midday on the 12th of each month, as long as Erina Jeranus is still alive, Sergius Verus will head to the Black Horse Courier office in the Market District and spend a brief amount of time there. Esta página foi modificada pela última vez à(s) 19h39min de 8 de novembro de 2011.